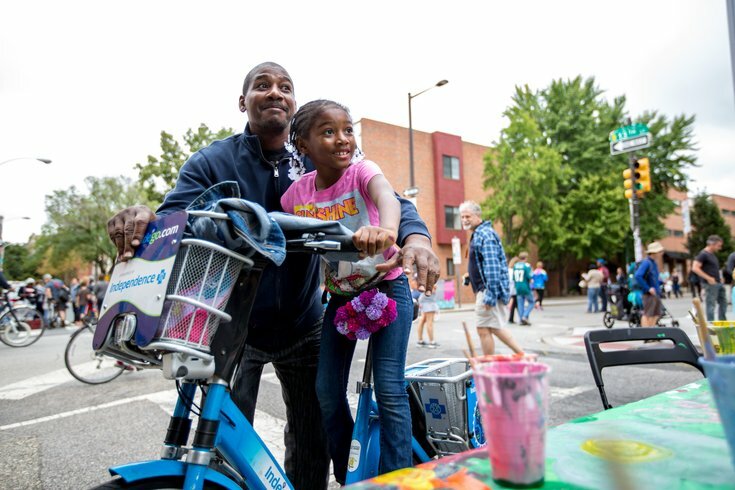 Rashid Brown helps Shana Mosley, 7, get on an Indego bicycle that she could ride safely in the streets during Open Streets PHL's Philly Free Streets event on Sept. 24, 2016. 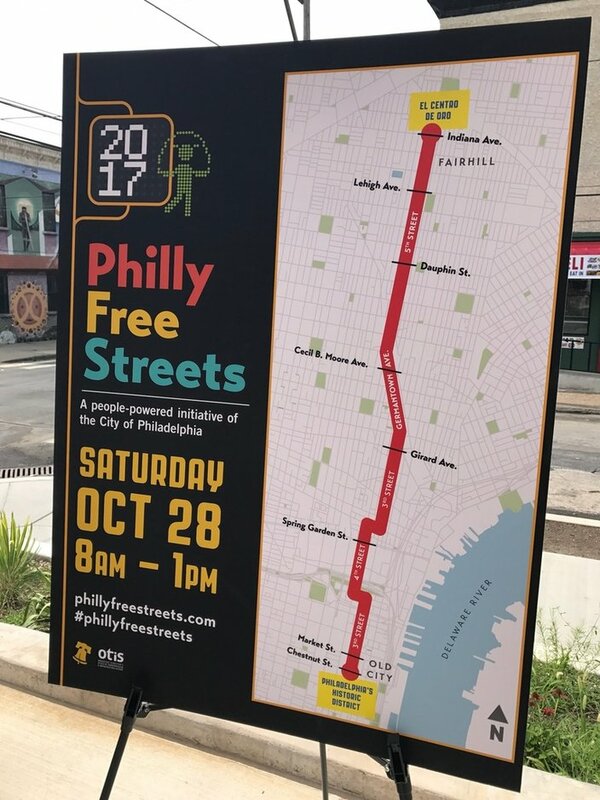 The 2017 Philly Free Streets event will occur from 8 a.m. to 1 p.m. on Oct. 28. The much-anticipated Philly Free Streets event last September brought tens of thousands of bicyclists, runners and pedestrians onto South Street. Ten months later, Philadelphia officials unveiled the details for its follow-up. The 2017 event will occur from 8 a.m. to 1 p.m. on Saturday, Oct. 28. Vehicular traffic will be prohibited on a 7-mile stretch of roads beginning at Third and Chestnut streets in Old City, continuing all the way to Fifth and Indiana in Fairhill. The area includes stretches of Third, Fourth, and Fifth streets and part of Germantown Avenue. "It's such a car-dependent society," Mayor Jim Kenney said during Friday's announcement. "People argue about parking all the time. ... We just want to deemphasize the car for a few hours in a given day so people can enjoy being out here and being safe." The selected route passes through a number neighborhoods, stretching north from the historic district to "The Golden Block" in Fairhill. City officials say they intend to shift the location of Philly Free Streets from year to year. "We wanted to make sure that we brought this experience to every neighborhood," Kenney said. "This is a city of neighborhoods. For too many years, neighbors like North Philadelphia, Southwest and Frankford and others were not paid attention to. "We want to make sure everyone in our city gets a chance to experience every neighborhood in our city." This map from a Friday press conference shows the stretch of streets that will be closed to cars for Philadelphia's next Philly Free Streets event, scheduled for Saturday, Oct. 28. Kenney said he would like to hold multiple open streets events each year. But he said even planning an annual event requires his staff to do a lot of logistical planning. "We will get there at some point," Kenney said. "Once a year is good right now. But we'd like to maybe do two events a year – something in the spring and something in the fall." The first Philly Free Streets event, held last September, was inspired by the open streets that organically occurred during the high-security precautions taken during the 2015 papal visit. Some 30,000 people flooded onto South Street, the Schuylkill River Trail, MLK Drive and West Fairmount Park for myriad activities – all excluding cars. There was an array of fitness activities, educational programs and arts and crafts. The event included 10 miles of roadways and trails stretching from the Delaware River to the Schuylkill River. "It was a pretty incredible day," Managing Director Michael DiBerardinis said. "It showed what's possible as we reimagine our streets and our neighborhoods." Many of the events that were part of last year's event will reappear this year, city officials said. That includes the Mural Arts Program, which will paint some small murals. "We are a venue for connection and engagement – and good cities think intentionally about how that can happen," Mural Arts founder Jane Golden said. "I see Philly Free Streets as being vital for the health and life of our city, because it helps create a social contract that connects all of us. It's a way to look at our diversity, but within our commonality." Some 90 percent of participants wanted to see a similar event held in their neighborhood, according to a survey conducted by PennPraxis. About 65 percent of those surveyed want the city to hold a monthly open streets event. Among businesses, 80 percent of those surveyed said they would support another open streets event. About 55 percent reported increased sales volume. The survey found that 54 percent of participants lived in zip codes located within a quarter mile of the route. Most started their day on South Street and headed west along the Schuylkill River Trail. Now, they'll have a chance to enjoy open streets again, from Old City to Fairhill.